In the previous installment, we've seen some code go through several iterations of refactoring. Refactoring without automated tests tends to make me uneasy, so I actually had a small shell script that called the script under development with several different argument combinations and compared it to an expected result. 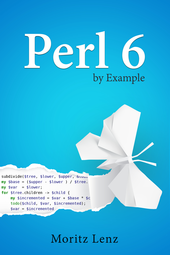 Let's now look at a way to write test code in Perl 6 itself. In the Perl community it's common to move logic into modules to make it easier to test with external test scripts. In Perl 6, that's still common, but for small tools such as this, I prefer to stick with a single file containing code and tests, and to run the tests via a separate test command. $ prove -e "" "./autotime test"
In a terminal, this even colors the "All tests successful" output in green, to make it easier to spot. Test failures are marked up in red. except that it does not declare the variable $anon. So it's a multi candidate that you can only call by supplying the string 'test' as the sole argument. The next line, use Test;, loads the test module that's shipped with Rakudo Perl 6. It also imports into the current lexical scope all the symbols that Test exports by default. This includes the functions plan, is and is-deeply that are used later on. plan 4 declares that we want to run four tests. This is useful for detecting unplanned, early exits from the test code, or errors in looping logic in the test code that leads to running fewer tests than planned. If you can't be bothered to count your tests in advance, you can leave out the plan call, and instead call done-testing after your tests are done. Both is-deeply and is expect the value to be tested as the first argument, the expected value as the second argument, and an optional test label string as the third argument. The difference is that is() compares the first two arguments as strings, whereas is-deeply uses a deep equality comparison logic using the eqv operator. Such tests only pass if the two arguments are of the same type, and recursively are (or contain) the same values. Each call to subtest counts as a single test to the outer test run, so plan 4; has become plan 2;. The subtest call has a test label itself, and then inside a subtest, you have a plan again, and calls to test functions as below. This is very useful when writing custom test functions that execute a variable number of individual tests. The test harness now reports just the two top-level tests as the number of run (and passed) tests. And yes, you can nest subtests within subtests, should you really feel the urge to do so.